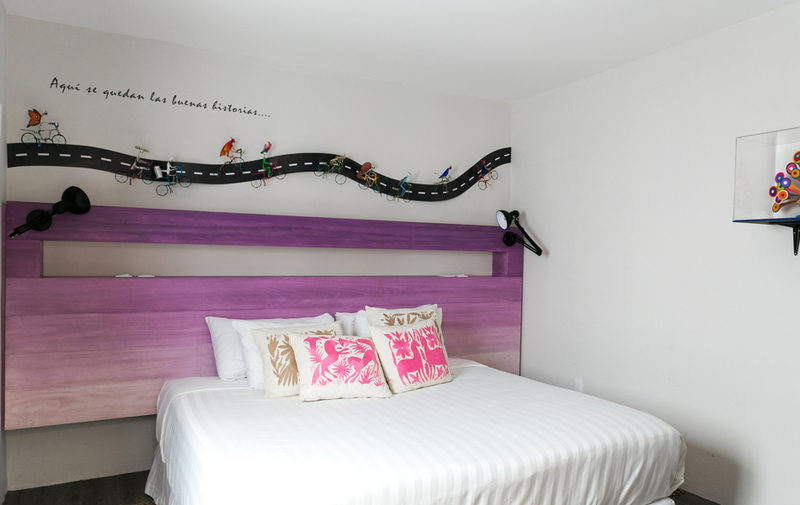 La Palomilla is a unique seven-bedroom boutique Bed & Breakfast located in the heart of La Roma, one of the safest neighborhoods in Mexico City. We are only three blocks away from the Chapultepec Castle and the Anthropology museum, a few blocks away from the famous restaurants Contramar and Maximo Bistrot, and a short cab ride from Pujol and Quintonil. Our house is filled with stories of friendship and Mexican culture. From the vibrant interior design in every floor, to the locally-sourced soap in your room, almost every element of La Palomilla supports a Mexican business or talented artisan. Each room has its own personality, defined by two key elements: a fragment of Mexican life, and a trait of our founder’s closest friends. Instead of a number, on every door you’ll find a friend’s nickname. As soon as you open it, you’ll discover a unique décor inspired by a colorful Mexican theme. Our Bed & Breakfast is located in La Roma, the neighborhood where the acclaimed movie “Roma” was filmed and the place it was named after. Just one block away is La Condesa, another of Mexico City’s safest and most iconic neighborhoods. La Condesa and La Roma are a hub of hip and delicious restaurants and bars, cool shops, young people, awesome galleries and walkable streets. They are a short cab ride away from Polanco and a hop away from El Centro. 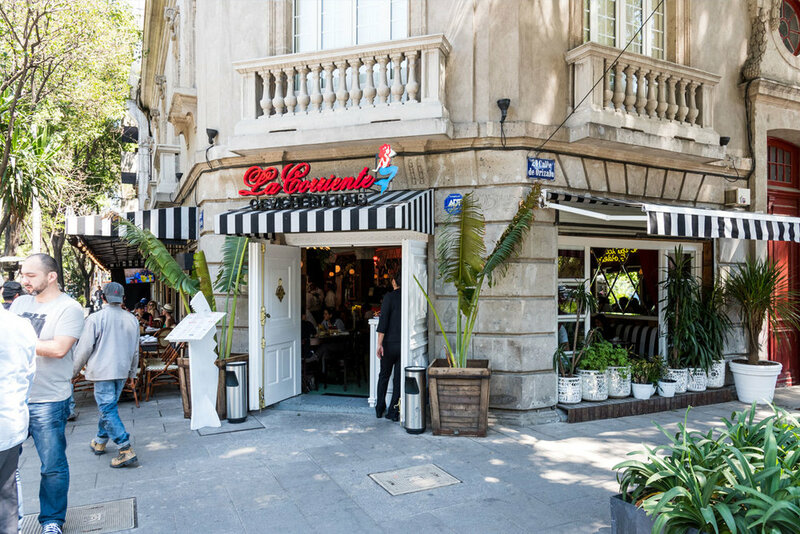 We are one block away from delicious Lardo restaurant, 3 blocks from the Chapultepec Castle and Anthropology museum, and 4 blocks away from the famous Mexican seafood restaurant Contramar. In Mexico, a “palomilla” refers to a group of your closest friends. In La Palomilla Bed and Breakfast, each of our seven rooms is a tribute to one of our founder’s friends, paired with a key aspect of Mexican art and culture. The walls, objects and furniture in every room portray a part of a special person–and a part of a special country. As you open your door, you’ll discover a unique décor inspired by a colorful Mexican theme. “Breakfast at my childhood home was pure and simple magic. Not just because of the pancakes or the motuleño eggs my Dad made, but also because it was the perfect moment to talk about our experiences”, recalls Alessandra, our B&B’s owner. Conversations at the table are some of her most cherished memories, but don’t let that distract you from the fact that delicious, world-renowned Mexican food is a key happiness factor found in this country’s everyday meals. Let us walk you through the first one of the day, framed by colorful woven baskets. You won't forget breakfast in Mexico. The perfect spot to relax with a glass of wine after a day of exploring the City. This charming rooftop is great for small reunions, with a seating capacity for 12 people. We are proud to have hosted wedding celebrations and other intimate special occasions at our terrace. Catch up on emails, have a cup of coffee, read or chat while you get some direct sunlight and relax under a high ceiling. But beware: such a cozy sofa, joyful hanging lamps and a charming interior design might keep you from leaving too early to your planned tourist activities. Reasons to visit Mexico City come in bucket loads, from food to nightlife, museums, art, culture, and people. With so many choices, it’s hard to know where to start–this is why we’ve put together a bunch of activities to help you out. We consider our guests part of our family, feel welcome to talk to us about your trip interests, we can recommend and help you organize plans we’ve tried and loved. We’re hard-core fans of foodie experiences: mezcal tastings, market visits, street food tours and cooking lessons. 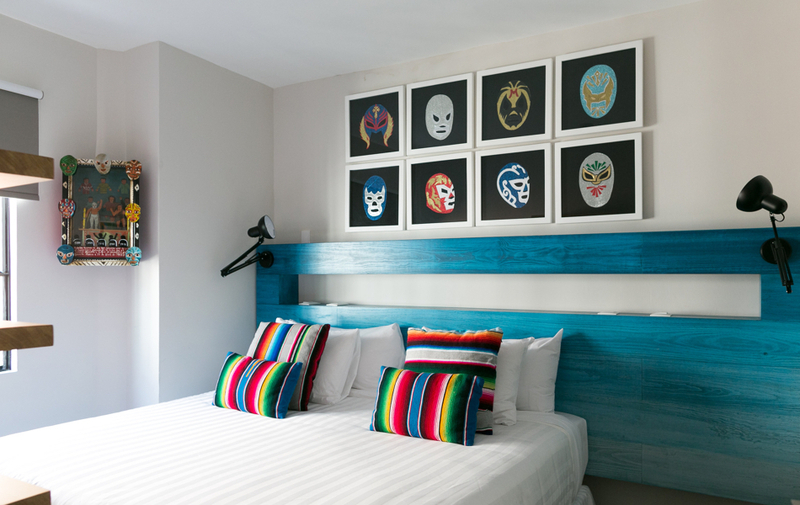 We’ve also put together a few you-can’t-miss, uniquely curated choices: Lucha Libre & Nightlife, Hidden Neighborhoods, The Cantina Route, Teotihuacán Pyramids and The Historic Center. Turn a little bit to the left. Stretch out your arms. Enjoy the terrace view. Are you ready for a relaxing and invigorating yoga session? You can have the teacher’s personalized instructions all to yourself or share them with up to 3 friends. A one-on-one addition to your vacation that you’ll appreciate after long trips, museum visits, and walking experiences! A massage should be a part of every single trip–especially if you can take it without leaving your B&B. Combining ancient techniques and modern approaches, you’ll get the perfect relaxation formula in Mexico City. Shiatsu, Swedish, Deep Tissue, Hot Stone or Sports–just choose your preference for today’s massage. You can always try another one tomorrow. Note: please book your massage at least 12 hours in advance so we can provide you with the best service. During special Mexican occasions, we don’t limit ourselves to recommendations–we bring the fiestas to our house. To celebrate Día de Muertos, every year in October and November we have an altar and offer classes to make sugar skulls, a delicious and traditional souvenir. In December, we prepare ponche, a traditional drink that’s part of every Christmas posada. We also bake delicious vegan buñuelos for our guests, and teach them how to make our grandmother’s Christmas cookies. Daily cleaning service. Gratuities are always appreciated! Shared lounge / TV area. Freshly baked cookies and aguas frescas every afternoon. Night watch: if you come in a late flight, don’t worry, we’ll have someone here to greet you–we have a night-time manager from 7:00 p.m. to 6:00 a.m.
For an additional fee, we offer airport pick up, private yoga classes, spa services, and other experiences and curated activities. La Palomilla B&B is a dedicated green business; each corner was conceived with sustainability and eco-friendly practices in mind. Maximum occupancy: two guests per room. Adults only. La Palomilla is not suitable, unfortunately, for children under 10. However, if you reserve the whole house, children all ages are welcome. In this case, please be mindful that kids need extra attention when going up and down the stairs, and adult supervision when they are in the terrace. We love pets–unfortunately, they are not allowed at La Palomilla. The terrace is open 8:00 a.m. to 10:30 p.m. Tips for our staff are greatly appreciated! You are welcome to bring your own beverages, including alcohol, as well as your own snacks. We encourage you to eat in the dining room, the terrace or the patio. We require an official ID and a valid credit card for check in. All areas are non-smoking. A fee of 50 USD will be charged if you do not follow the policy. In case of damages/missing items in your room or any part of the property, repair/replacement costs will be charged to the credit card provided at your arrival. This includes the ChromeCast in your room. Please make sure it's there on arrival and on departure. The replacement fee is 75 USD. If your room key and card are lost or damaged, you'll be charged a replacement fee of 50 USD. If we do not have the key at check out you will be billed. Every visitor must check in. If they stay overnight, a 60 USD plus tax fee will be added to your account. Please accompany them to the door when they leave. Keep in mind only two guests per room are allowed. La Palomilla will not assume any responsibility for damages or loss of any merchandise or articles left in any area of the facility prior to, during, or following a stay. We will not be responsible for accidents or injury to guests or for the loss of money, jewelry, phone chargers, computer equipment, or valuables of any kind. Please keep ALL your valuables in the safe at all times. Please be careful in the property, just as you would at home. If you were to have an accident, please dial 911 from the house phone immediately. It is forbidden to bring drugs (including marihuana, which is illegal in Mexico) or weapons into La Palomilla. All guests must respect the rights of other guests and the staff for the peaceful enjoyment of the premises. Violent or substantially disruptive behavior, related or unrelated to substance use, will not be tolerated in public or private areas. This includes, but is not limited to, threatening other guests or the staff and any other violent behavior towards others, destruction of property, making excessive noise and having high volume visitor traffic in your room. Continental breakfast is complimentary; we offer a full Mexican breakfast for an additional fee. The property is located on a small side street with no automobile access. There is a parking lot around the corner of La Palomilla, on Colima 410. Guests can be dropped off at the corner of the Inn (on Guadalajara the main street and the corner of Segunda Cerrada de Guadalajara), and walk about 15 steps to the property. La Palomilla staff will help you take your luggage to your room. If your stay is between October 1st and March 31st, 50% of the total stay deposit is required when making a reservation. Full payment is due if reservation is made within the non-cancellable period (15 days prior to arrival). The remaining payment is due upon check in. 100% of the total stay deposit is required when staying between April 1st and September 30th. The rates and packages are non-refundable and changes are not allowed during these dates. La Palomilla reserves the right to pre-authorize credit cards prior to arrival. We accept Paypal, Visa, and Mastercard. If paying with American Express, an additional 6% (including taxes) will be charged. Supplements like city tax and tourism tax are not calculated automatically in the total costs and will have to be paid for separately during your stay. For cancellations at least 15 days prior to scheduled arrival during stays between October 1st and March 30th: full refund of the deposit. A $40 USD fee per room per night will be charged for every cancellation For stays between April 1st and September 30th, reservations are non-refundable and non-transferable. There will be no refunds for no-shows or cancellations made within 14 days of the scheduled arrival. The B&B will retain the payment just as if the guests had stayed during their booked nights. We suggest getting vacation insurance, which is affordable and readily available from several providers online, to protect you against covered unexpected events. We are a small bed and breakfast and cancellations affect us severely. Our policy is firm regardless of the reason for cancellation, interrupted stay or early departure. We cannot be responsible for unused rooms due to late or canceled airline flights, family emergencies, or acts of God. book direct and get a special gift!